Earl & Marion Johnston have been an integral part of the square dance movement in New England, as well as throughout the United States, for over half a century. Earl started calling while still in High School in Rockville, Connecticut. In the early 1950’s. Earl made the transition from the traditional form of square dancing to the modern “western” style. Earl, along with AI Brundage, started the Connecticut Callers Association and together they ran a callers school that is still being held each year under new leadership. Earl also conducted caller schools and clinics in several states throughout the nation. Earl has been described as a “triple threat” caller as he ran a very successful program with several clubs locally. He also was a very popular traveling caller and certainly was in great demand as a teacher of callers. Putting back into square dancing some of what he and Marion had derived from the activity was always a goal of this couple. Earl was instrumental in the formation of NECCA, the New England Council of Caller Association, and served as the first chairman of this organization. Earl was inducted into the Sets in Order American Square Dance Society Hall of Fame in 1970. He was a charter member of CALLERLAB and has served on its Board of Governors. CALLERLAB recognized his contributions to our activity by awarding Earl their most prestigious Milestone Award in 1993. Earl and Marion were inducted into the Square Dance Foundation of New England’s Hall of Fame in 1995. 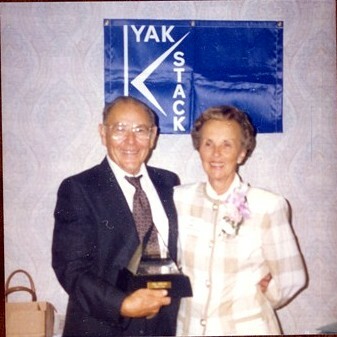 Earl is the caller who introduced the Yak Stack Speaker, that was developed by Erwin Gross, which made it possible to sound halls in a manner so all could hear. For many years the “Johnston Touch” delighted dancers as he traveled throughout the United States, Canada and several European Countries. Earl recorded on the Grenn record label, wrote articles for various publications and published a very successful caller note service. The inspiration and commitment of the Johnstons to our activity has served as an example to all leaders. The New England Cooperation Committee, acting on behalf of the dancers of New England, is proud to acknowledge their contribution to our activity.